Growing up in Boston, Steven Julien-Stewart witnessed the gentrification of the city’s neighborhoods, although at the time he didn’t fully understand what was happening—he just knew his neighbors were moving away. Julien-Stewart has moved between different Boston neighborhoods, ranging from the South End, one of the city’s more affluent areas, to Dorchester, one of its poorest. Poverty and lack of equal opportunities for people of color are two issues that motivate Julien-Stewart, a self-described community activist and aspiring entrepreneur. One of his recent pursuits is learning to write software through Resilient Coders. 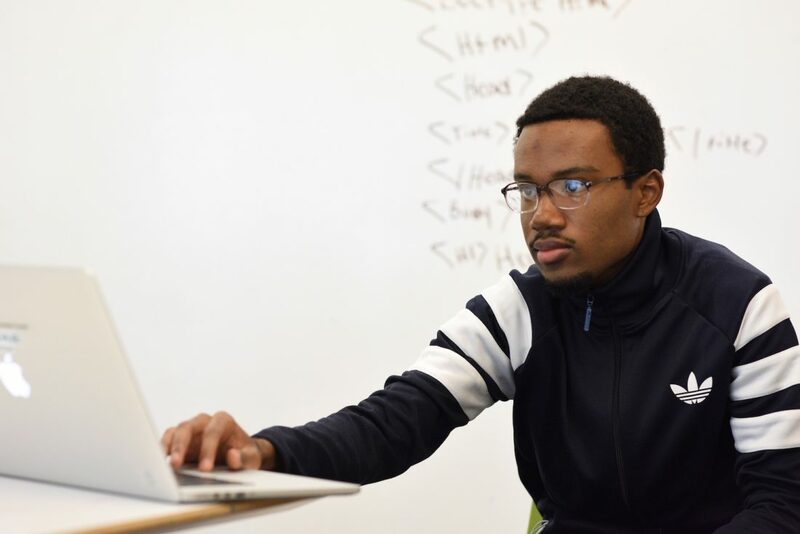 The two-year-old Boston nonprofit teaches Web development skills to teens and adults from underserved communities and helps connect them with job opportunities. “Coding I see as a universal key,” Julien-Stewart says. “It allows me to go through doors that I probably wouldn’t go through” otherwise. Resilient Coders is part of a wave of organizations that have popped up in recent years offering short-term software training programs. The idea is to teach participants the skills needed to land good-paying jobs in the fast-growing tech industry. There is evidence the approach can work. A 2016 Course Report study surveyed 1,143 graduates of 52 coding bootcamps and found that 73 percent of them had gone on to secure full-time software jobs; those positions boosted their wages an average of 64 percent, or $26,021 annually. But some observers have raised concerns that many coding bootcamps aren’t accessible to everyone. The average student pays nearly $12,000 in tuition, and that doesn’t count the costs incurred if the student quits his or her current job to take coding classes full-time, plus the time it takes to find a job after completing the program. The irony is, programs meant to provide a ladder to more lucrative careers often end up serving people who already have opportunities—namely, middle-class, college-educated white men. In this year’s Course Report study, roughly 76 percent of the coding bootcamp alumni surveyed had at least a bachelor’s degree, 55 percent were men, and 70 percent were white. In other words, some coding schools aren’t doing much to improve the lack of diversity in the tech industry. To be fair, that’s not a core focus for a lot of the organizations—but some have made it a fundamental part of their mission. Resilient Coders is one of the software training organizations that specifically aim to serve groups that are underrepresented in the tech industry, such as women and people of color. Others include YWeb Career Academy in Madison, WI, Ada Developers Academy in Seattle, and Laboratoria in several cities in Latin America. Resilient Coders founder David Delmar, a self-taught software designer and developer, was working at PayPal’s Boston office when he started thinking of doing something about the lack of diversity in tech. He was at an industry conference a few years ago, at the “height of the app obsession,” he says. Delmar, whose parents emigrated from Mexico, says he didn’t see many people of color in tech and “decided that’s a serious problem” he wanted to try to address.